The Santa Fe hiking trails are some of the best in the country, and it certainly shows! Outdoor enthusiasts from all over the world flock to “The City Different” to take advantage of the incredible trails that meander through Northern New Mexico’s unparalleled scenery. Whether you’re in search of your next hike or looking to add something fun to your Santa Fe itinerary, you’ll certainly want to check out the Dale Ball Trails. This extensive trail system extends 22-miles and is located just a short distance from downtown, making it a convenient and exciting adventure for most Santa Fe visitors. Interested in learning more? Read on to discover some of the most popular activities along the Dale Ball Trails and don’t forget to request your free copy of our Chimayo Vacation Guide for even more local hiking recommendations and activities. The Dale Ball Trails system is one of the most visited hiking areas in Santa Fe, and it’s very easy to understand why! With over 22-miles of Sangre de Cristo mountain trails to explore and incredible sights to see, you could spend days experiencing everything it has to offer. Here are some of the best things to do along the trails that are sure to delight everyone in the family! This may not come as a huge surprise, but it’s on this list for a reason! Both experienced and beginner hikers can find their fix on the Dale Ball Trails, and once you feel like you’ve explored it all, you will be delighted to find that there is still more to see. Each trail is also marked with a unique numbered sign at the junctions, making them simple to navigate and simply wander from trail to trail without getting lost. Once you’re done, the trails’ convenient location makes it easier than ever to hike back into town just in time to grab something to eat at one of the local restaurants or continue your Santa Fe adventures. Of course, the main draw for the Dale Ball Trails are the views! During your hike, you’ll be sure to see many spectacular mountain views, and at times you’ll even be able to see the city of Santa Fe from a whole new angle. Don’t forget your cameras! In addition to hiking, mountain biking is another very popular activity on the Dale Ball Trails. Bicycles are permitted on any of the trails, but previous visitors have stated that which segment you choose to ride in should vary on your skill level. The northern segment of the trails is much more suited to beginners. The further south you ride, the more challenging it becomes and you’ll be required to spend a greater amount of physical and mental strength. However, if you’re up to the challenge, it is an experience that you’ll be talking about for years to come. A few other popular Santa Fe hiking trails are actually connected to the Dale Ball Trails! If you’re interested in extending your excursion, here are the other routes that we’re sure you’ll love. The Atalaya Mountain Trail is easily one of the top hiking trails in the region. Its popularity is so apparent that several local guidebooks will highly recommend it, and so do we! The 6-mile out and back trail will lead you through stunning aspen forests before rewarding you with a spectacular mountain top view at the end. It’s also rated as a relatively easy trek, making it ideal for any traveler! At only 1.9-miles, Dorothy Stewart Trail is a favorite among hikers in search of a quick and easy excursion. The loop winds through the Santa Fe National Forest and provides lovely views in the foothills of the Sangre de Cristo Mountains. If adventure is calling your name, then we have just what you need to satisfy your inner explorer. Call us today at 505-351-4805 to reserve your stay and don’t forget to mention the New Mexico High Country Hiking Package! Where you stay during your Northern New Mexico getaway can make all the difference towards a truly memorable escape from reality. That’s why our guests love the Southwestern-inspired guest rooms and ambiance of Casa Escondida Bed and Breakfast. 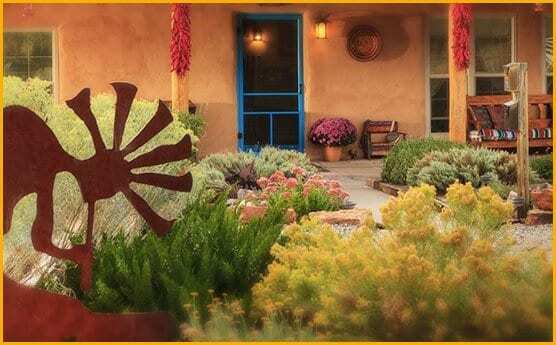 Instead of your typical hotel accommodations, our guests will find a peaceful retreat right in the New Mexico countryside and in the foothills of the Sangre de Cristo and Jemez Mountains. Plus, you’ll enjoy hand-picked Southwestern antiques in each room and a delicious homemade breakfast made fresh each morning. Want to bring your furry friends with you? No worries! Our pet-friendly rooms are perfect for dogs and provide a cozy place for everyone to retire after a full day of exploration. Check our availability and book stay with us today! We can’t wait to see you in Chimayo soon.